Charbonneau’s first Toronto exhibition features many works on paper and large-scale paintings. Space is the dominant theme in his works. While both, the works on paper and paintings, show a masterful knowledge of colour choice and space, the works on paper demonstrate a degree of restraint in their study-like play. This translates into the larger paintings yet due to their scale, also allows one to be encompassed by the overlapping networks of shapes and lush surfaces that Charbonneau constructs. A graduate of architecture, the artist is interested in the way space is imagined, appropriated, and inhabited. Lived space is neither uniform nor random, rather it is influenced by culture and experience. It is precisely this human space that interests Charbonneau. In certain instances, his paint application is so thick it creates a third dimension, expressive of the artists’ virtuosity. Toward the Horizon features the delicate watercolours of Myron Jones. Included in the exhibition are works from Jones’ Charentes, Lorenzana, and Tuscany series. Jones translates his travels through France and Italy into intimate works on paper through subtle variations of colour and composition. 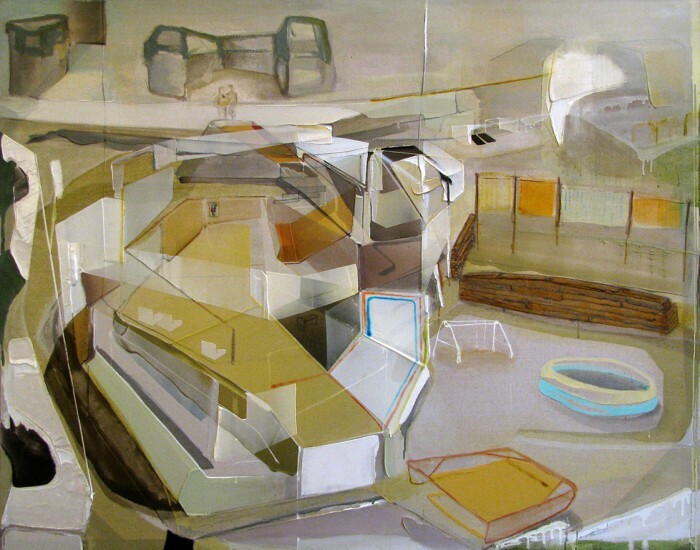 Jones is a Toronto-based artist working in oil, acrylic, and watercolour. His work is housed in the collections of the Canada Council Art Bank, City of Vancouver, Surrey Art Gallery, and other private collections across the country.